News - McCormick, Fitzpatrick, Kasper, and Burchard, P.C. Clayton v. J.C. Penny Corp, 2017 VT 87 (Sept. 22, 2017). Reversing Commissioner’s decision that general release settlement language was void against public policy and thus relieving Claimant of the effects of the Agreement. Absent allegations of fraud or material mistake of fact, Commissioner’s authority in this matter is limited by Section 662(a) “the only consideration to be made is whether it is in the claimant’s best interests and the Commissioner is given latitude to make that determination only at the time of the initial approval of the settlement agreement.” Case remanded to determine whether claimant’s left- and right-foot injuries are causally related. Haller v. Champlain College, 2017 VT 86 (Sept. 29, 2017). Split decision upholds Commissioner’s determination that value of tuition free college credits earned in the 26 weeks prior to the work injury are included in Average Weekly Wage calculation for permanency benefits as a “other advantage” as set forth in the statute 21 V.S.A. §601(13). Justice Skoglund dissents: “Including in the calculation of weekly wage any fringe benefits that are not paid in lieu of wager or are not an explicit substitute for wages will create a morass that will overwhelm employers and the workers’ compensation system.” Justice Eaton also dissents citing to Lydy v. Trustaff, Inc. 2013 VT 44 which rejected including health insurance premiums paid in the Average Weekly Wage calculation as not remuneration, similar analysis would apply to free college tuition as not remuneration but rather a fringe benefit. Collette v. Hannaford Bros. Co., Opinion No. 12-17WC (Sept. 1, 2017)(ALJ Phillips). Green v. Oldcastle, Inc., Opinion No. 13-17WC (Sept. 27, 2017)(ALJ DeBernardi). Defendant’s Motion for Summary Judgment denied as material issue of fact in dispute as to whether Claimant had a fixed place of employment when he was injured on his way to a construction site. Fact that Claimant paid for portion of travel time when injured not determinative of compensability as Defendant argues payment mere inducement to encourage employees to work at far flung locations. Erica Mongeon of Waterbury, Vermont, was hired as the new WC Administrative Assistant B for the Workers’ Compensation Program otherwise known as the “voice” of the Department position, replacing Ellen Gonyaw who moved to Maine. Jane Woodruff has stepped down as Administrative Law Judge. The Department is currently interviewing candidates for her replacement. Julie Charonko, long, long, long time WC Specialist II, is retiring from the Department and moving to Florida. We wish her well! Adecco USA Inc. V Colombia Forest Products, Inc., Case No. 2:15-cv-25 (July 8, 2016)(Judge Sessions) On Cross Motions for Summary Judgment, Columbia Forest Products successfully defends indemnification argument by Adecco the temporary hiring agency for the injured employee injured in the course of working at Columbia Forest products. Court found no express indemnification language in the contract between Adecco and Columbia Forest Products and implied indemnification language fails as well. “Because the parties’ contractual arrangement essentially required CFP to pay for workers’ compensation as part of the mark-up it paid to Adecco, there is no viable equitable argument that it would now be fair to shift the cost of [the injured workers’] workers compensation benefits to” Columbia Forest Products. Bindrum v American Home Assurance Co. 2016 WL 4446533 (unpublished Entry Order)(August 19, 2016). Hall v. Safelite Group, Opinion No. 10-16WC (July 15, 2016)(ALJ Phillips). Meunier v. The Lodge at Shelburne Bay Real Estate LLC., Opinion No. 11-16WC (July 27, 2016)(ALJ Woodruff). Hilliker v. Synergy Solar Inc., Opinion No. 12-16WC (Aug. 9, 2016)(ALJ Woodruff). Pro se Claimant settled on a full and final basis for compensable left foot injury but Settlement Addendum included language purporting to release Defendant, Insurance Carrier and TPA from “any and all” claims. Subsequently Claimant makes claim for right foot condition which she alleges arose out of her employment with Defendant but separate and distinct from the left foot injury. Commissioner holds that “a release that purports to cover not only injuries arising form a pending claim, but also those that might arise from completely unrelated causes at any time during the injured worker’s employment is impermissibly broad. It undermines the employer’s incentive to manage its risk appropriately, and absolves it from responsibility for protecting its employees from work-related harm. Because it thus violates critical public policy objectives, it is void.” Commissioner allows factual determination to see if right foot injury arose out of settled left foot injury (which would be barred by the settlement agreement) or some other non-covered incident which would allow Claimant to proceed with the litigation. Haller v. Champlain College Corp., Opinion No. 14-16WC (Aug. 24, 2016) (Belcher ALJ). Defendant denies claim based upon physician’s report on causation. At subsequent deposition, physician now agrees with treating physician “that Claimant’s current condition represents the natural progression of her compensable 1990 and 2003 work-related injuries, without any contribution form non-work-related causes or events, Defendant’s only issue in this case evaporated.” Summary judgment prior to formal hearing was granted to Claimant with an award of attorney fees and costs. Dispute over causation of Claimant’s shoulder condition, Claimant’s IME doctor found more credible then Defendant’s IME doctor based upon third factor (“clarity, thoroughness and objective support underling the opinion”) of the five part Geiger test for determining which of the competing medical opinions was more persuasive. Form 28 COLAs due July 1 with increase of 2.8% with new minimum rate of $420 and new maximum rate of $1,259. Also recall that pursuant to the new WC Rule 8.2010 Form 28’s must now also be filed with the Claimant. Comment period for the proposed new WC Rules involving Opiate treatment, Attorney Fee rates and Vocational Rehabilitation provider rates ends on July 14. Claimant exercises statutory right to videotape entire neuropsych test over objections of Defendant=s expert that such videotaping would render the test results unreliable and compromise the proprietary nature of the written test materials. ALJ rules that video recording through one way mirror or behind the examinee. “[t]hough perhaps not perfect, these steps represent an effective compromise between the examinee’s rights and the examiner’s need for valid test results…. In addition, in order to protect the proprietary nature of the test materials, I conclude that it is reasonable to prohibit Claimant from disclosing the video recording to anyone (including her attorney) other than directly to another qualified expert neuropsychologist.” Claimant failed to give 3 “full business” days notice of intent to videotape and thus Claimant is liable for late appointment cancellation fee of $1,600. Defendant not allowed to suspend benefits alleging that Claimant failed to attend the IME when she failed to give adequate notice of her intention to videotape the exam. Claimant not found to be at medical end result as continuing to improve with PT despite three prior unsuccessful PT modalities. No TTD award for period of time when Claimant canceled PT for unknown reasons. Permanency awarded based in part upon Claimant’s IME’s opinion, and also in part on Defendant’s IME opinion as to impairment. Claimant’s testimony and treating physician=s opinions found more credible then IME doctor’s opinions given inaccurate understanding by IME doctor of nature of injury. Claimant not succeed on burden of proof in interpreting AMA Guides as to whether radial styloid can be added to impairment rating following arthroplasty of carpal bones in wrists. AMA Guides Table 16-27. Claimant’s claim for broken leg arising out of his work for Defendant found compensable over Defendant’s allegations of fraud. “In fact, it is Defendant’s version of events that I find implausible. For me to accept its account, I must conclude that Claimant, his wife, his sister and possible his mother as well conspired together to defraud his employer. They would have had only 17 minutes… to concoct their story, presumably with him directing the effort whole lying on the ground in severe pain. They would have had to do so notwithstanding, his understanding that the Defendant’s video surveillance system was fully operational….” Claimant’s fact witnesses claim of Attorney client privilege upheld given allegations of fraud and potential legal ramifications thereon for these fact witnesses. Claim for attorney fees reduced by 10% given Claimants’ counsel’s “unfamiliarity with Vermont’s Workers’ Compensation Law and process…” on a $31,987 attorney fee request. 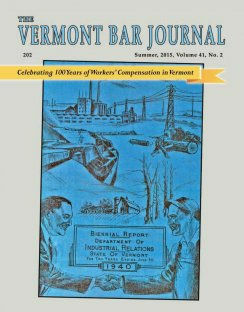 VERMONT WORKERS’ COMPENSATION UPDATE JUNE TO SEPTEMBER 2015 by Keith Kasper, Esq. Two new WC specialists have joined the VT DOL. The new WC rules went into effect on August 1, 2015. The COLA for July 1, 2015 was 1.023 with the new minimum compensation rate of $408 and the new maximum compensation rate of $1224. While Claimant’s ongoing medical treatment is causally related to 2006 compensable work injury, Claimant failed to prove that his not working is related to that injury and thus no TTD benefits are payable following Claimant’s going out of work in 2014. Claimant’s most recent employment with a new employer did not cause an aggravation of the work injury relieving Defendant of liability for ongoing medical treatment. ALJ accepts physical therapist’s opinion over that of IME doctor. “As a doctoral level physical therapist, Ms Bell has the requisite training and expertise to render an opinion, and her status as Claimant’s treatment provider adds to, rather than detracts from, her credibility.” Defendant required to pay for ongoing medication. “That Claimant already was treating for a pre-existing condition – his narcotics addiction – at the time he was injured does not change Defendant’s responsibility to pay for causally related, medically necessary treatment. What matters is simply that, as currently prescribed, Suboxone is an effective treatment for th injury-related chronic hip pain from which he now suffers. At least until the drug ceases to be helpful for that purpose, under §640(a) Defendant is obligated to pay for it.” Attorney fees limited in relationship to extent of Claimant’s success on the merits of the claim. VERMONT WORKERS’ COMPENSATION UPDATE APRIL TO JUNE 2015 by Keith Kasper, Esq. Florence Godin has retired after 23years in state service. She will be replaced by Paul Donovan former State Law Librarian. Effective July 1, COLA increases for weekly indemnity benefits is effective in the amount of 2.3% with a new maximum compensation rate of $1,224 and a new minimum compensation rate of $408. New WC Rules become effective on August 1. Attorney fees awarded following informal conference when initial denial based upon “‘lack of investigative evidence to determine causal relationship to employment.’” Treating physician altered initial treatment note to show causal connection to work but Defendant did not rescind denial. Kurant v Sugarbush Soaring Association, Inc. (Kurant III), Opinion No. 8-15WC (April 13, 2015).